Places where you can walk...maps, websites, books,..
Walkers like variety—easy, hard, short, long, steep, flat, open, in the bush, ..... and while the trails around our neighbourhoods are the most used of our repertoire of trails, we're often looking for different routes, different places to walk. Whitehorse, the wilderness city. 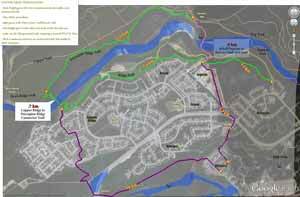 A collection of walking ideas is about making Whitehorse a great walking city. Included are over 75 circular walks, almost 600 km of walks to tempt both tourists and locals. Check often as updates happen frequently. 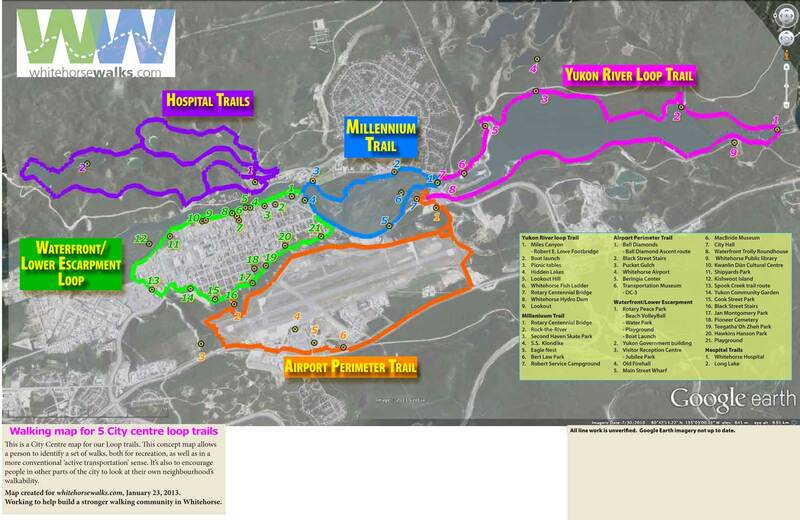 Walking communities has maps, Parks, interpreted trails and other walking ideas outside Whitehorse. Wolf Creek Trail, Wolf Creek Campground. 1.7 km return: packed gravel surface with benches, interpretation and viewpoint with picnic area overlooking the Yukon River valley. There's a nice parking area right at the trailhead inside the campground. 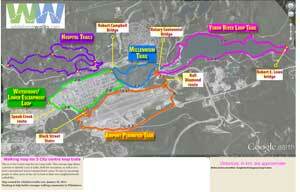 Contagious Mountain Bike Club (facebook page) sells a good map (version 3?) of Grey Mountain trails. 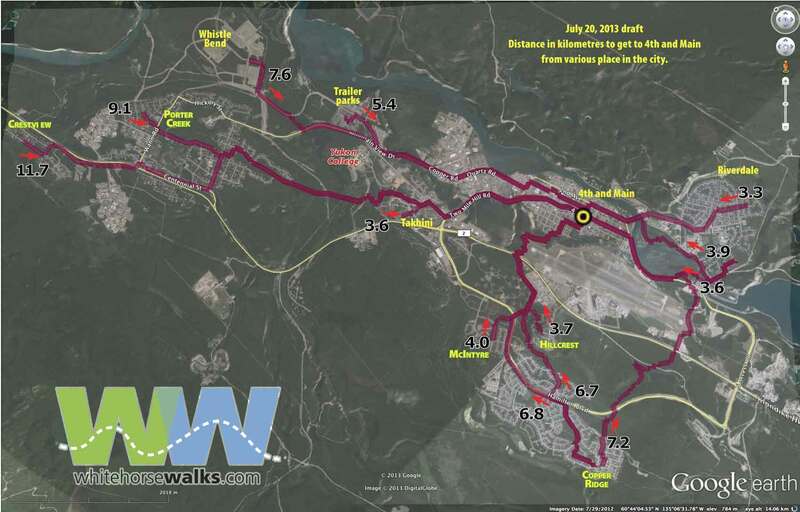 Yukon Wildlife Preserve: Self-guided walking tour with an informative trail guide and a map indicating the walking routes and locations of the animals; a 2.5 or 5 km loop; must be conducted during daylight hours; last summer entry is at 4 pm and recommended last winter entry is at 2 pm. Fee. For free topographic maps of Canada go to Maptown and find the map number you would like: Then, go to the Index of Canadian Topo maps, choose the map number and download. Gunnar Nilsson & Mickey Lammers Research Forest has nice interpreted trails (map). Whitehorse caches to look for. rockclimbing.com has a number of places one could walk in to. Lands and resources: Community, site-specific and rural settlement land maps and land claim agreement. Yukon.cais a start of YG informations such as campgrounds. Summer: 8:00 a.m. to 8:00 p.m daily. Fall/Winter: Monday to Friday from 8:30 a.m. to 5:00 p.m. (closed during noon hour); Saturday 10:00 a.m. to 2:00 p.m. I'm making a set of PDF maps based on an image of the entire city with trails, developed in Google Earth. Zoom in using the PDF zoom tool. Start with areas you know, like your neighbourhood, then explore. Think about trails which you've hiked, which ones you'd recommend that visitors can safely do. If we ever get the community energy to have a walking festival here, which walks would you recommend? 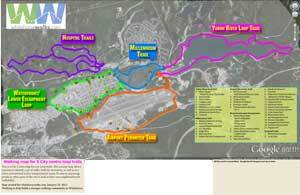 Here's the Legend, and some trail discussion, including a start of a named trail database. The 5 OCP parks: Thinking about walking trails, what do we want our parks to be like? 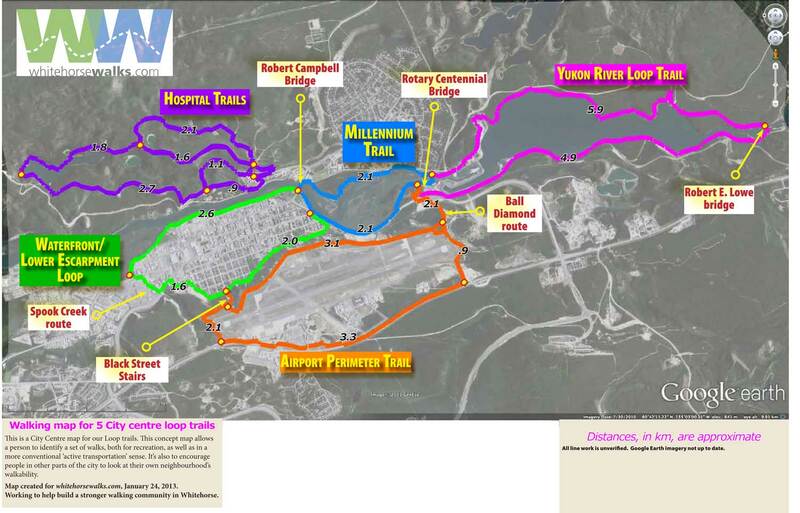 Whitehorse Corridor – Alaska Highway project: Highway corridor map, Overview/legend and highway intersections. The highway has the potential to encourage more walking, or to discourage it. NOTE: The maps are fairly detailed prototypes: 65 x 28 inches ~7-8mb. Don't try to print them. The maps are created for discussion. They are not provided to claim safe trails. No responsibility of conditions or accuracy is implied by presenting these maps. Observations, corrections and additions are very welcome. Improvements will come as people proof them, by walking them! Transportation Management Demand Plan's desire to get people out of their cars. To me, that means walking. If I was walking to work I'd want to know the fastest routes and the more interesting alternatives. To the right is a first draft, discussed in my Transportation Demand Management Plan submission. Take a look at my ideas for better walking page for other walking ideas.